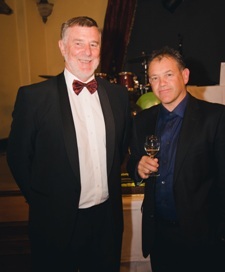 Roger Fewtrell, Company Founder (left) in 2014, celebrating Southern Hospitality Ltd's 25th Anniversary. Southern Hospitality Ltd was founded in Dunedin by partners Hyam Hart and Roger Fewtrell back on 7 October 1989 and opened by Sir Clifford Skeggs the then Mayor of Dunedin. Today the company has become a major player in the catering and hospitality industry. Many people know of the company, however many know little of what Southern Hospitality actually does. Southern Hospitality is like a mega kitchen store for the hospitality and food service industry. Stocking over 13,000 product lines imported from over 400 manufacturers in 35 countries. With 1 million items in stock, we offer everything from teaspoons to furniture to combi–ovens and much, much more. All products are specially selected for the strength and reliability that the commercial sector requires. The buyers from Southern Hospitality spend over two months each year overseas at trade fairs and factories looking for new and improved products so customers continue to receive the latest products and inventions at the best possible prices. We have a dedicated design division with fifteen full time designers who specialise in the design of commercial kitchens and preparation areas, bars, restaurants, cafes and other public areas in hospitality. Southern Hospitality can take care of the complete project from the design to obtaining resource and building consents to construction, fit–out, installation and after sales service. Southern Hospitality can talk to you about your concept, put plans in place, do the job and virtually hand over the keys when the entire project is finished. We do as much or as little as you require. Employing over 80 chefs, bakers, and experienced hospitality–trained staff makes the difference. All our people are passionate about the industry and we are proud to be able to support young people entering the industry by offering sponsorship for culinary competitions and prizes to secondary and tertiary training institutions as well as scholarships to tertiary hospitality and food service students. We enjoy investing back into our industry’s future. With 15 showrooms nationwide, Southern Hospitality have local service in all parts of NZ. Each one of our showrooms are well stocked and attractive places to shop and they all have a warehouse attached to provide the backup stock of consumables such as glasses and crockery. Southern Hospitality has three stainless steel fabrication plants enabling us to provide the total supply solution in a completely seamless way. These three factories specialise in the fabricating of Stainless steel benches, bain-maries, extract systems, wall linings - basically all things stainless steel. In addition Southern Hospitality has a mechanical company providing and installing extraction systems. The company is 100% NZ owned and operated and over 95% of the shares belong to people who work in the company – the people you deal with are probably shareholders. With all of this in mind you can be assured that your experience with Southern Hospitality will be pleasant and productive!